Yes, another enchilada recipe. (In case you missed it, here are the Chicken & Spinach Enchiladas.) Here’s what I dig about enchilada recipes. They are so delicious and so easy to put together…but they do take a little bit of time with the rolling and snuggling of the enchiladas in the baking dish. For this reason, I like to make 2 pans at once…one to bake and one for the freezer. When making freezer enchiladas, I recommend making them in a disposable foil baking dish (9×13 size), unless you have a plethora of 9×13-inch glass baking dishes on hand and can afford to have one in the freezer. I prepare the enchiladas as directed, all the way up to the point of baking. I let them cool down (if anything was cooked and heated in the assembly process) a little bit, then cover them with foil and slip them into the freezer. Then pull them out in the morning to thaw, when I know I’m going to have one of ‘those’ afternoons. I can bake them from partially frozen by adding a little bit of time and keeping them covered with the foil for part of the baking time. 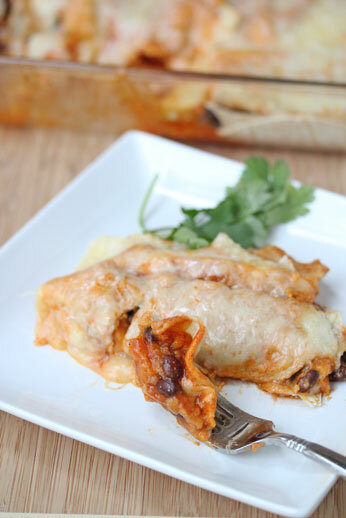 Kaboom, I win at busy weeknights…and you can too, with these enchiladas!